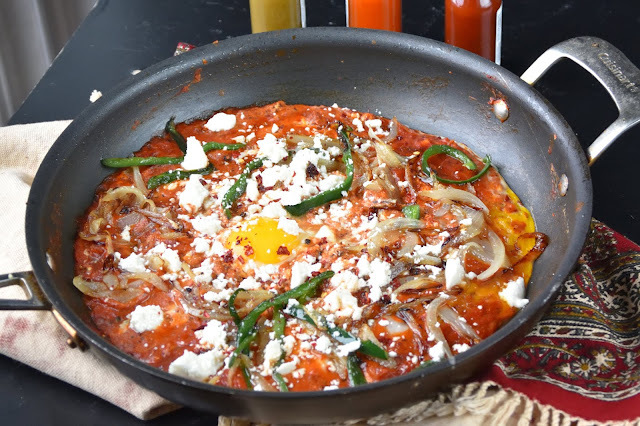 The Iranian style Shakshuka is called "Omelet"; despite the fact that it has nothing to do with the original French dish, save for its common eggs. Persian omelet is a tomato sauce, with beaten eggs scrambled in. Less popular alternatives might involve unbeaten eggs which are poached in tomato sauce. My favorite Omelet has two eggs poached, one mixed in the sauce. Presented here is a Mexican inspired version with Ancho chili powder, Mexican oregano, Poblano chili, Queso Fresco, and cumin. Finally, the key ingredient in this recipe is the tomato. 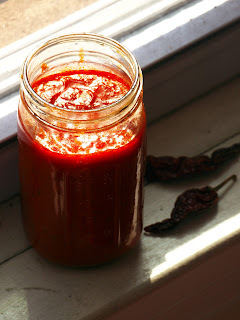 Using high quality canned, or fresh summer tomatoes will be greatly rewarded. Make the sauce by sautéing the onion and Poblano first. To a large pan add the oil and onion and Poblano slices. Sauté on medium heat for 10 minutes or until lightly browned. Remove the onion and Poblano slices from the pan and set aside. To the same pan add the garlic, chili powder, spices, sugar, and dried herbs. Toast the mixture in oil for 30 seconds. 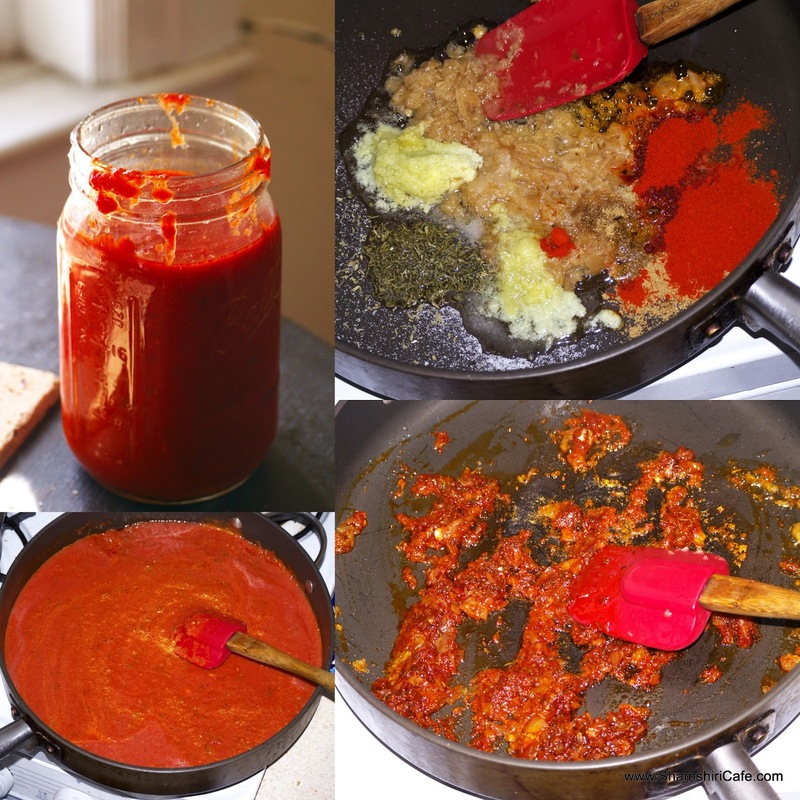 Add the tomato puree, decrease the heat to medium, and let the sauce simmer for 10 minutes. Adjust the sweet balance based on taste. The sauce can be labeled as Tex-Mex Marinara, stored, and later used as an all-purpose sauce. 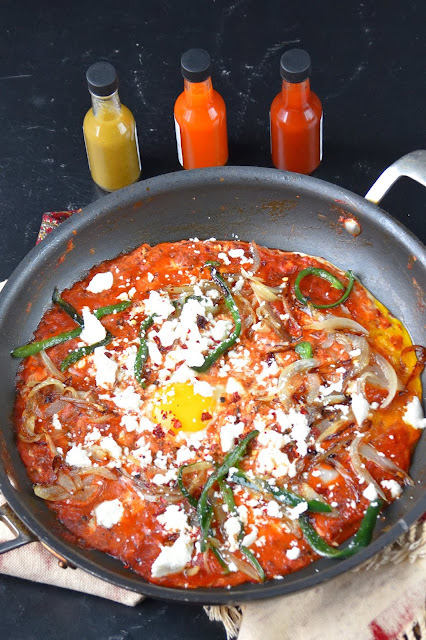 To make shakshuka (an individual serving based on one thirds of the recipe is shown here), let the sauce thicken on high heat - nothing is worst than a soupy Shakshuka. 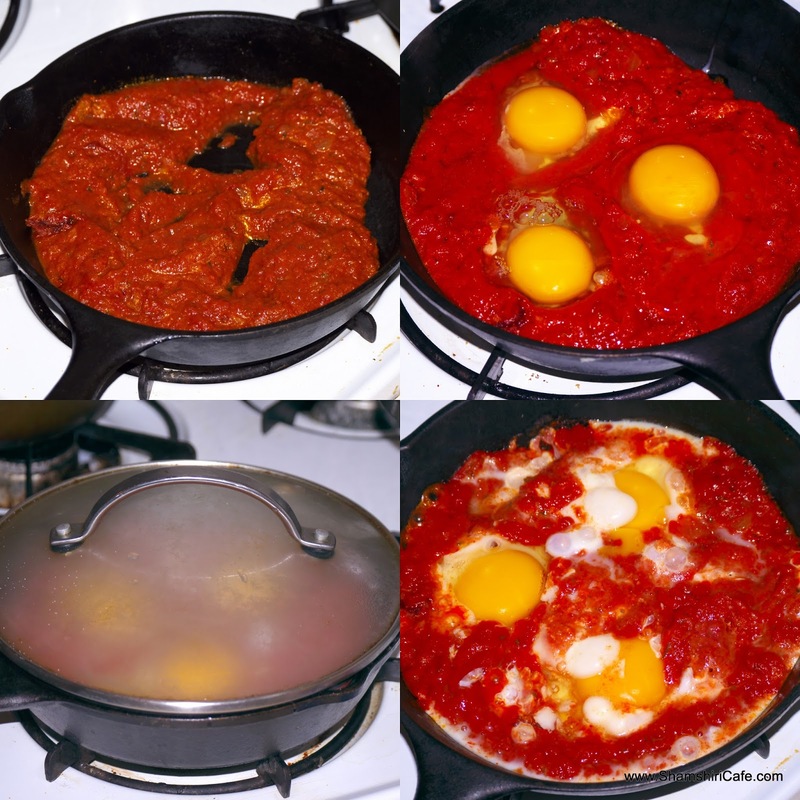 When the sauce is thick, decrease the heat to medium, and add the eggs in different locations. While the eggs are cooking, gently mix their whites with the sauce without disturbing the yolks. You may, alternatively, mix three of the eggs (out of nine) in the sauce. Cover the pan for a minute to make sure the whites are fully cooked. Do not overcook the yolks. When yolks are done, cover the surface with the onion and Poblano slices. Garnish with crumbled Queso Fresco before serving.